When you see your name next to Emory Tate's on the pairings chart, adrenaline may rush through your body as you prepare to face a vicious predator. One of the most feared players in the U.S., Tate has built a reputation over the years as a swashbuckling tactician who will try to slash you to bits as brilliantly as possible… and he doesn't disappoint. Born on the west side of Chicago, but spending formative years in Indiana, (USA) Emory Tate Jr. was taught the game of chess by his father Emory Sr. Indiana is a fairly active chess state, but in the early days of stardom, Tate spent a lot of time in the Chicago area creating a buzz with his hyperactive play. If one observes closely, it is easy to get a glimpse of his brilliant mind. Tate's reputation received a boost while he served in the Air Force and was 5-time Armed Forces Champion. His travels have given him the opportunity to make a foray into European chess. Of course, Tate has some comfort in these environments since he is fluent in Russian and has decent command of other languages. What is most amazing about Tate is his ability to analyze complicated variations with amazing clarity and speed. His post-mortem analysis sessions often draw huge crowds (some standing in chairs) to witness his entertaining spectacle. Tate will pepper his vivid commentary with "triple exclam!" while rattling off a series of moves with a quickness. During his sessions, the crowds are spellbound by his amazing ideas, humorous barbs and incisive color commentary. He has even received generous applause after his sessions. Amazing! If one examines Tate-Yudasin, or Kudrin-Tate, it is apparent that his games have a magical tone. How about the Queen sacrifices in Tate-Sagalchik, DeFirmian-Tate and Kaufman-Tate? Even when Tate doesn't win, his play sparks imagination… see Tate-Ashley. Tate has a large collection of GM scalps (80 by his estimate) and many often wonder why he hasn't achieved the rank of Grandmaster. By examining the games above, it is apparent that he has GM talent. He also reached the 2500-rating barrier after winning the Eastern Open in December 1996. 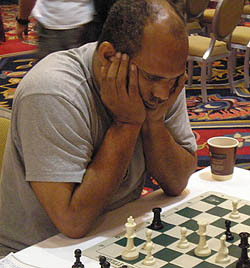 Most recently, Tate qualified for participation in the prestigious 2006 U.S. Championship after a sterling performance at the 2005 National Chess Congress. His appearance will be highly-anticipated an will add a new level of excitement to the field. Tate added another chapter in his long history of accomplishments by clinching the International Master title at the 2006 World Open. For many years, Tate's strength at this level has not been in question and as mentioned before has scored some fascinating victories. Hopefully Tate will gain more opportunities to earn GM norms so he add a final "triple exclam" to his litany of accomplishments. Tate has inspired chess players the world over, but in particular, he is considered by many players of African descent to be a legendary figure in the annals of chess history.